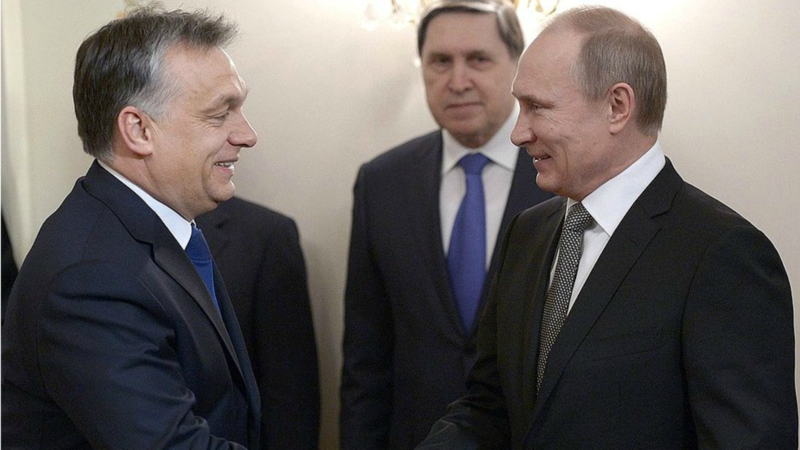 The Budapest meeting with the EPP-affiliated Orbán – who wants the European Union to lift its punitive measures – was Putin’s first visit to a bloc member since the shock election of US President Donald Trump in November. Experts said Trump’s ascendancy and the wave of populism sweeping across Europe is emboldening the two strongmen to push harder against the EU. At a joint press conference with Putin, Orbán denounced what he called “a strong anti-Russian atmosphere” in the West. 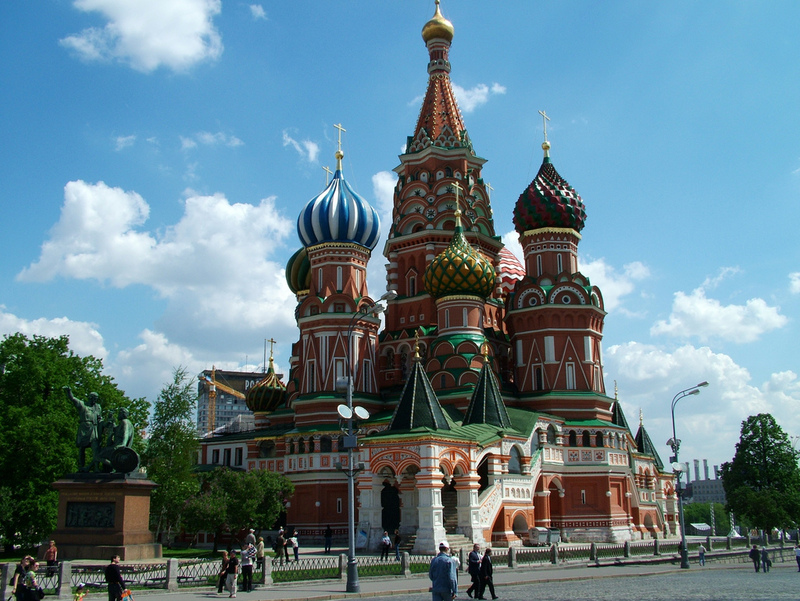 “Anti-Russian policies have become fashionable in the West,” he said in the Hungarian parliament. But “the world is in the process of a substantial realignment and we believe that this realignment will create more favourable conditions for the EU-Russia,” Orbán added. 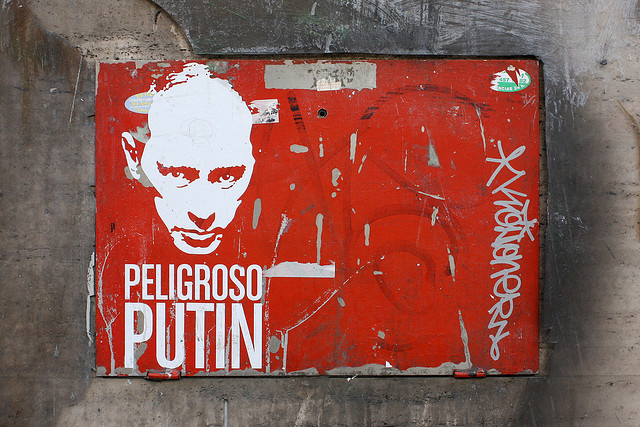 Putin meanwhile hailed Hungary as an “important and reliable partner for Russia in Europe”. The Kremlin hopes that Trump’s apparent affinity for Putin will lead to a thaw in frosty ties between Moscow and Washington. Relations have plunged to a post-Cold War low over Ukraine, where violence again escalated this week despite a December ceasefire. The eurosceptic Orbán – one of the few leaders to publicly support Trump – enjoys close ties with Putin but has yet to break ranks with the EU and formally oppose the sanctions imposed on the Russian economy for the last three years. Russia has stepped up its efforts to consolidate ties with governments and forces in EU countries sympathetic to Moscow, for historic or economic reasons, or both. The EURACTIV network reports. “Orbán will take a step closer to Putin in terms of rhetoric due to a change in the international context,” said political analyst Andras Deak in Budapest. 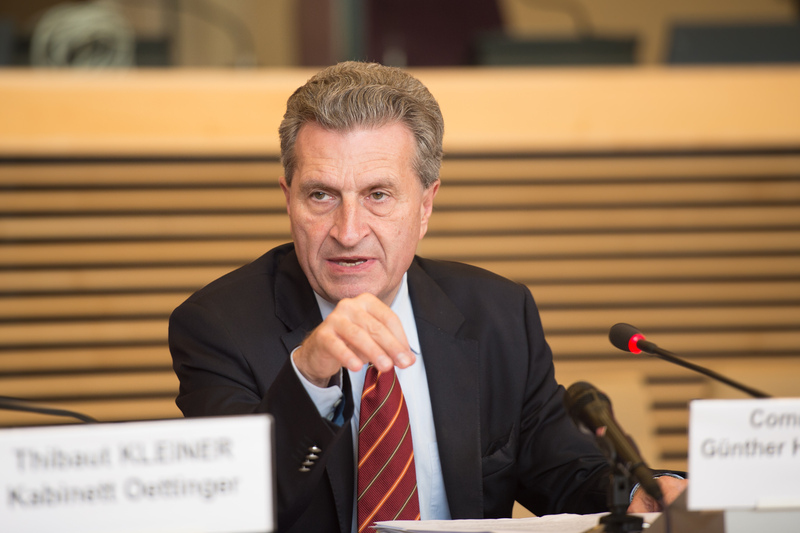 EU sanctions were extended in December until the end of July 2017, despite some nations increasingly questioning their impact. Brussels’ focus on maintaining unity on Russia sanctions could take a backseat as fears mount that Trump’s policies pose a major threat to the already bickering bloc and nationalist parties gear up for elections in the Netherlands, France and Germany. Thursday’s discussions included Russia’s planned expansion of Hungary’s only nuclear power plant and other energy issues, with Budapest highly dependent on Russian gas imports. “We are ready to finance the expansion 100%,” Putin said on Thursday. Construction of two 1,200 megawatt reactors at the Paks plant outside Budapest has been viewed sceptically by the European Commission, which is yet to give its green light to the project. Ahead of the visit, the Kremlin said the meeting “bears witness to the personal ties and confidence” between Orbán and Putin. 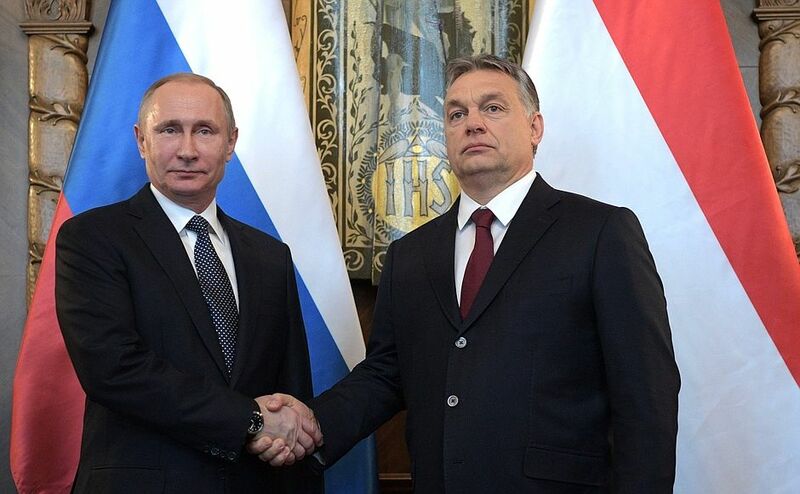 The pair have met regularly over the past six years and Orbán was the first European leader to welcome Putin after his annexation of the Black Sea Crimea peninsula from Ukraine in 2014. While state media hailed the new meeting as a sign of Hungary’s key role in improving East-West relations, the left-leaning news website 444.hu said Putin was counting on Orbán to help “disrupt the (EU and NATO) from the inside”. Orbán said last month that Trump’s aggressively nationalist push signalled a welcome move away from the “illusion of federalism” to a “bilateral” era, notably in economic and military matters. As Putin’s convoy left the parliament area, around two hundred demonstrators, one holding a placard reading “Russians go home!”, blew whistles in protest at the visit. “A war criminal like Vladimir Putin has no place in the Hungarian parliament,” said one of the protest organisers during a speech. “It is to Viktor Orbán’s shame that he welcomed such a person,” said Viktor Szigetvari. 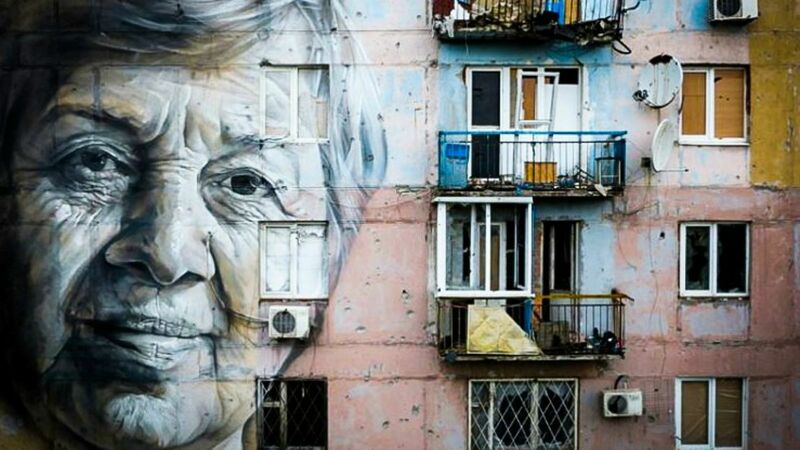 Thursday’s visit took place amid a sudden uptick in bloodshed in eastern Ukraine, with at least 20 people killed in recent days. Ukraine’s president appealed for more global pressure against Russia yesterday (2 February) as Moscow-backed rebels and government forces clashed around a frontline town in an upsurge of fighting that has claimed a reported 25 lives. Russia and Ukraine lashed out at each other, with Kiev saying one of its planes was shot at over the Black Sea during what Moscow called a “dangerous flyby”. Ukrainian President Petro Poroshenko on Thursday also warned he wants to hold a referendum on his country joining NATO, in comments bound to further irk Moscow. 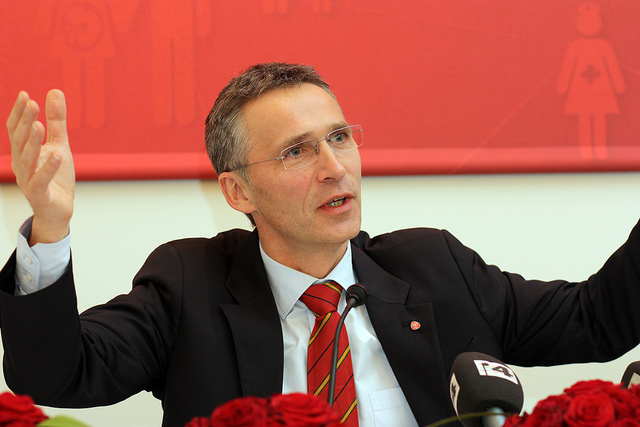 NATO Secretary General Jens Stoltenberg called on Russia yesterday (1 February) to use its “considerable influence” with rebels in eastern Ukraine to end what he described as “the most serious spike in violations” of a shaky truce there in a long time. The conflict has claimed nearly 10,000 lives since 2014, more than half of them civilians. The Kremlin denies backing the insurgents in eastern Ukraine and only admits that Russian “volunteers” and off-duty soldiers have entered the war zone of their own free will. “Ukrainian authorities are not ready to apply the terms” of the 2015 Minsk peace accords, Putin said Thursday. The great trading oil buddies is here. Google “Code Trading System”.